Now you have the opportunity to learn from the comfort of your own home, on your own time and at your pace! Online classes include interactive eLearning segments, hands-on learning activities, video segments from Dr. Williams Sears, at home activities, free downloads, and more! 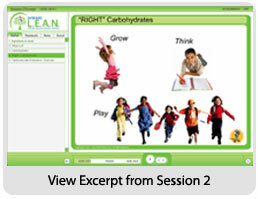 Each interactive eLearning segment segment includes recorded narration, script, colorful graphics, interactive activities, check for understanding quizzes, and more! You can expect to spend approximately 30-45 minutes completing each eLearning segment, and you can view each segment as many times as you would like during the duration of your training. Learn more about L.E.A.N. Start courses. Learn more about Prime-Time Health courses.